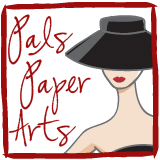 I sure hope you can play along with Pals Paper Arts this week! It's a fun inspiration, so get ready! Come back tomorrow and see the full reveal of what I've created above. Oh, wow! I am loving the colors! I can't wait to see the entire card! Loving ALL the peeks and these colors are gorgeous... but I DO I see pokes in that paper??? Hugs. Patti! This flower is beautimous :) Love it!